In your workplace, it’s crucial to ensure workers have the skills and knowledge needed to recognize a forklift tip-over hazard. Workers should understand how forklift tip-overs happen and how to prevent these accidents. Not only does this knowledge protect workers from accidents, but it protects your business from costly damages and devastating OSHA fines. During a forklift tip over, the lift truck will usually tip over forward or to the side. Tip-overs in both directions usually happen for different reasons. The lateral tip over (sideways) often occurs when the driver is crossing from a paved surface to an even surface. And a longitudinal tip over (forward) can happen when operators are driving down a ramp. 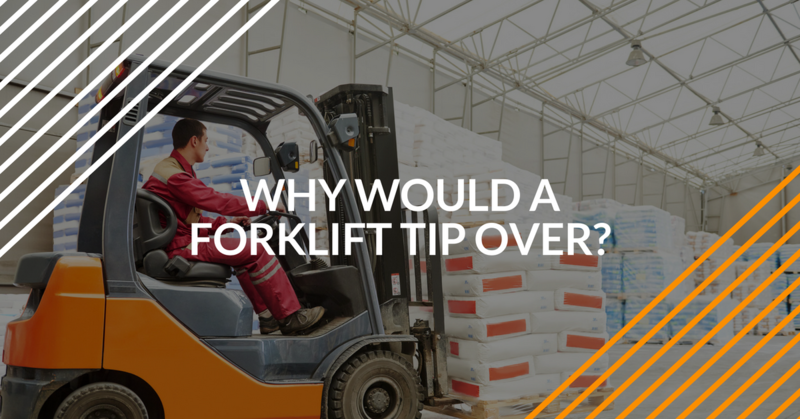 However, each of these forklift tip-overs can happen for a number of reasons, and it’s important to know what they are. Exceeding the recommended load rating for a forklift can cause the lift truck to become imbalanced and unstable, resulting in a tip over. When operating a forklift, always make sure the load you’re carrying falls within the manufacturer’s recommended load weight limit. Instability from a mast tilting forward often happens because the forklift is driving down an incline. It’s often recommended that operators drive a forklift backward down a ramp to avoid this issue. Speeding up or stepping on the brake too fast can cause the forklift to become unstable very quickly. It often happens when the center of gravity of the lift is pushed too far forward or backward. This also goes for turning a corner too rapidly. It’s important that all forklift operators learn about the center of gravity from the stability triangle. They can read about here. Lifting or lowering a load while on a slope or ramp can put the center of gravity off balance and cause a forklift tip over. Make sure the forklift is stable before driving up or down a slope. Additionally, when handling a load, avoid carrying loads that are moving or active. Turning a corner too fast can bring the forklift off its center of gravity. This can cause a wheel or one side of the forklift to lift off the ground. When this happens, it is likely that the forklift won’t be able to recover from the instability and will tip over. Turning the forklift with a load that is raised too high on the mast can result in a forklift tip over. This is because it extends the load too far away from the lift, increasing the allowable load moment. The maximum load moment describes the way the weight of a load is distributed. When a load is extended too far away from the carrying mechanism, it increases the effect of the load on the forklift. It also increases the load center distance. Turning a forklift at any speed while on an incline can cause the forklift to become unstable and tip over, using the gravity of the forklift against the incline to pull it down. While forklifts are sturdy machines, they aren’t invincible to obstacles. Driving over a pothole or some other type of object can cause the forklift to become imbalanced and tip over. No matter which way a forklift tip over happens, forward or sideways, there are a few safety protocols that can protect operators from injuries and fatalities. Jumping from a forklift tip over may seem like the right thing to do at the time, but doing so can result in workers being crushed or pinned by the forklift. Once a tip over starts to happen, operators should make sure they are buckled up. Operators should brace themselves in the opposite direction of the fall with their hands on the steering wheel. This position will help prevent serious injuries. Other ways to avoid forklift tip-overs can be found on this page. There are many ways to prevent a forklift tip over, but each and every technique starts with operator training. Thorough forklift training will teach operators how to use the forklift properly and safely. They’ll be able to recognize and avoid hazards and prevent accidents like tip-overs. It also helps prevent costly equipment damage and fines from OSHA.